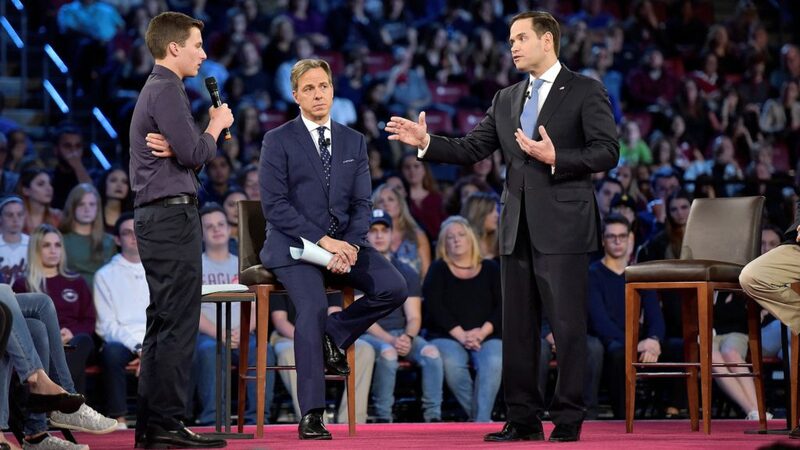 Cameron Kasky, a 17-year-old student at Marjory Stoneman Douglas High School in Parkland, Florida, confronting Sen. Marco Rubio live on CNN for his support for the NRA. Like many people, I’ve watched in awe as an army of teenagers has taken on the National Rifle Association and the extraordinary proliferation of guns across America. As organic as any movement ever created, it spontaneously erupted from the survivors at Marjory Stoneman Douglas High School in Parkland, FL, who were cowering in classrooms and closets as their classmates and teachers were gunned down. It started with three busloads of kids, some coming straight from funerals, going to Tallahassee to vent their anger at those who are supposed to represent them. That awe comes from watching kids use their old playrooms to meet and organize on one of the great political debates of the day. That’s a helluva thing, no matter what your political persuasion. After all, at every graduation I’ve ever attended — and probably every one that you attended too — the mantra has always been that the graduating group are our future leaders. And there they are leading, whether they were prepared for it or not. To put this into kid-perspective, consider that the Columbine massacre happened in 1999. And many more have taken place since then. That means that today’s high school seniors, born in 2000, have always lived with instructions regarding potential attacks, lock-downs and places to hide. 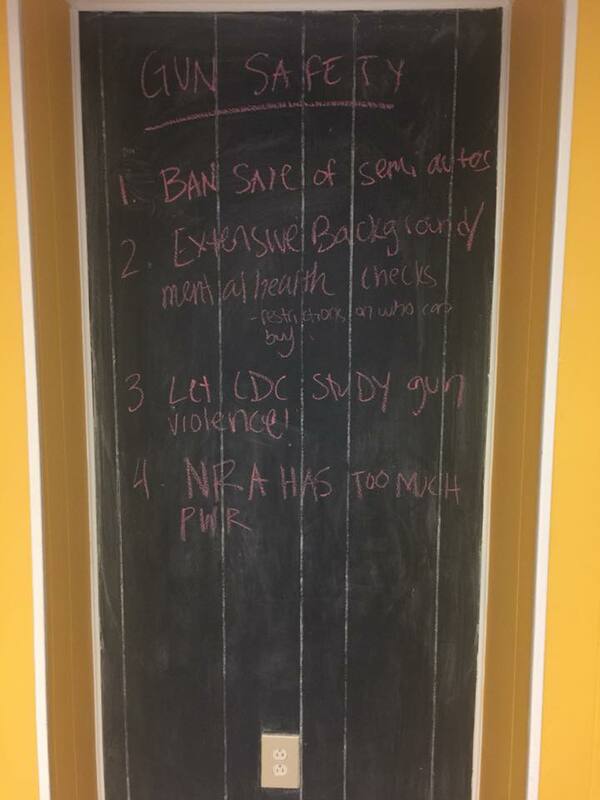 The objectives list, on our basement chalkboard that my kids have used throughout their lives. But kids brought up to hide are not hiding now. They’re out there now in force, not only in Florida, but around the country. One of my own teenagers, just days after starting a Facebook group to organize and see how students here in Westchester County can assist, had 500 members in just days. And that’s for a strictly local group in a place that already has decent gun safety laws. Kids are interested in doing what they can. Big time. My oldest — soon bound for college — met with some friends in the basement playroom this weekend. An initial objectives list they put together on their old chalkboard is shown here. In the Harry Potter series, the Hogwarts kids form Dumbledore’s Army to combat the dark arts. Today’s kids were raised on these books, which inspired so many to become active readers. That fantasy world of a kid army at Hogwarts, in one sense, seems to be springing to life around us as they mobilize. Battle, of course, can take many forms. None are so stupid as to believe that a magic wand will suddenly make them safe. Raised in the era of social media, they know that their weapons of choice will have nothing to do with physical (or magical) arms, but the art of mass movements, protest and persuasion. And voting as they all come of age. The #BoycottNRA movement has already caused the NRA to lose valuable relationships with car companies, airlines, hotels, banks and insurance companies. One would expect that less money means less financial support for politicians that have been doing its bidding in exchange for contributions. Decreasing the power of the NRA is already underway. And that is before any nationwide boycotts or walkouts have occurred to help bring yet more attention to the issue. In other words, it is likely that the Florida kids are already making a substantial political difference. Some have now started pushing their older brothers and sisters to avoid Florida for spring break, to pressure pressure their legislators to act. As they organize, they will, of course, make mistakes, though none will be as grave as those that allow guns to be purchased willy-nilly, with less regulation than a driver’s license. Others will get sucked into debates over protecting schools, as if malls, movie theaters, restaurants, and the entrances to sports/music venues (among other places that people gather) couldn’t also be targets for madmen and terrorists alike. And still others will get sucked into Second Amendment debates. They should not. For it isn’t a question of “supporting” the Second Amendment, but of its (mis)interpretation. Even under the deeply strained logic of D.C. v. Heller that reversed prior law to say that the Second was an individual right instead of a collective one belonging to a well-regulated militia, it didn’t say that all gun safety laws were unconstitutional. It said that an absolute ban was. Finally, some will try to argue with the gun fetishists, which are the loudest group of opponents to gun safety. This is useless and unproductive. Focus on the politicians, and the responsible gun owners who are, like you, appalled by the epidemic of gun deaths. 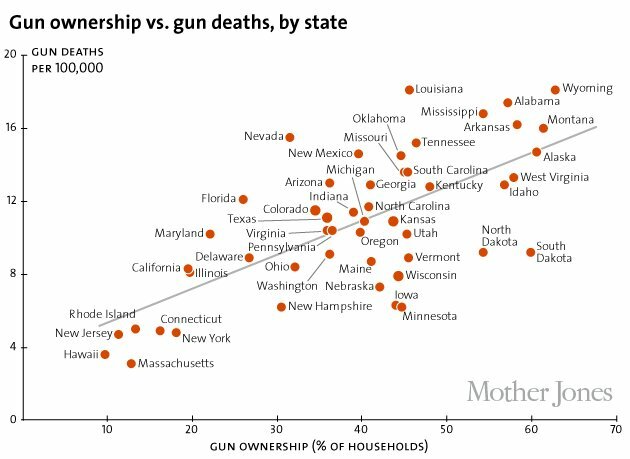 Given that many states that have good gun safety laws have withstood legal challenges — and those laws correlate to lower rates of gun deaths that those with lax safety laws — one should not stop arguing for gun safety. Most folks don’t know that New York has one of the lowest rates of gun deaths in the nation, not just because of our gun safety laws, but because our surrounding states also have them making it less likely that they will be trafficked into New York. The graph you see here is extraordinary, with that grouping states in the lower left corner of NY, CT, MA, NJ and RI. If the kids were asking me — and none of them have, though it hasn’t stopped me from offering up my two bits — I’d urge them to do everything possible to maintain the focus on tightly restricting access to guns of all kinds. It’s the big picture of 30,000+ annual gun deaths that counts, and they shouldn’t let anyone try to play small ball with them. As the kids step forth into politics, they might well be asking how it is that, when an overwhelming majority of America wants gun safety, it hasn’t yet happened. They may find themselves looking for the first time at how the influence of gerrymandering and pubic financing for elections has resulted in radicals being elected to office. The subjects are related. Hopefully, they will also figure out fast not to overstate their case, giving opponents material to latch on to in order to distract the conversation. The gun debate is hardly new, and was the subject of an early ’70s All in the Family episode when I was growing up. It’s been fought over long before this generation was born. The question is, will our Twenty-First Century Kids succeed where my generation has failed? Don’t let anyone tell you “it’s too soon” after a tragedy. It has been going on for decades. It will not magically end on its own. Go kids, go. Your parents are cheering you on to accomplish something that prior generations have been unable to do. Go forth into the battle for gun safety laws. All of our lives depend on it.